In early 2014, the UK Digital Skills Taskforce – an independent expert group chaired by Maggie Philbin and set up at the behest of the Labour Party – produced its interim report on ‘Digital Skills for Tomorrow’s World’. This is an important document, which highlights what might be done to equip people, throughout their lives, with the abilities to survive and thrive in a digital world, and to overcome digital exclusion. As set out in its preamble, the report “puts forward recommendations for government but also for what students, parents, schools, communities and businesses can do immediately to make sure people of all ages benefit from the opportunities offered by the acquisition of digital skills”. But what is the relation to information literacy? However laudable the intentions of the report, it exhibits the tendency shown by many advocates of digital skills and digital inclusiveness to focus heavily on technological skills, articulated notably around ICT and/or computing know-how and confidence. This is too narrow an approach to the relationship that individuals, in a knowledge-based society and economy, need to develop with information. Consequently, InformAll – jointly with CILIP and the CILIP Information Literacy Group – has produced a joint response to ‘Digital Skills for Tomorrow’s World’ emphasising that enabling individuals to handle information – making them information literate – provides a vital underpinning to the acquisition of digital skills, and to the reduction in digital inclusion, that are envisaged in the report. 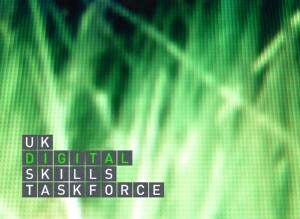 The UK Digital Skills Taskforce is very receptive to comments and wishes to engage in a dialogue with interested parties. The Taskforce’s reaction to InformAll’s joint response has been positive. At a practical level, it has helped to lay the basis for a dialogue with Maggie Philbin and her own TeenTech initiative, leading to the creation, in 2015, of a joint TeenTech-CILIP award for information literacy – an imaginative opportunity to place IL more firmly in the minds of young people and the school education sector.